Claudia McDonnell’s article in the Catholic New York, “Faith and Reasoning,” gives a digest of the talk and issues. For nearly a month the Dominican friars of the Province of Saint Joseph (the Eastern Province) elected and/or appointed as capitulars will be at Providence College doing the normal business of governance and making a review (and coming to some decision) on how they live the charism given by Saint Dominic. 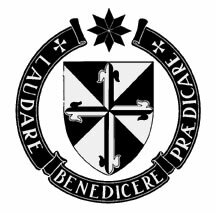 Beginning today the 35 friars will enter a period of reflection and prayer as they prepare to elect a new Prior Provincial and other province officials. The vote for the new Provincial will be Friday, June 11. Please beg the Holy Spirit and ask for the intercession of Saint Dominic with the Dominican blesseds and saints to ask the Lord to shower these friars with clarity of thought, charity and courage to make good decisions. Also, go to the Blessed Virgin Mary and Saint Joseph for help. What happens in the next few weeks charts the course for Dominican mendicant life for the next four years. As point of interest, the Dominicans in North America (the Eastern, Southern and Canadian Provinces) are electing new leadership and assessing their fraternal life and apostolic priorities. O wonderful hope which you gave to those who wept for you at the hour death, promising after your departure to be helpful to your brethren. Fulfill, father, what you have said and help us by your prayers. You who shone by so many miracles worked on the bodies of the sick, bring us the help of Christ to heal our sick souls. Fulfill, father, what you have said and help us by your prayers. Amen. O sacred Banquet in which Christ is received, the memory of His Passion is recalled, the mind is filled with grace, and pledge of future glory is given to us. At churches around the world today we’ll notice processions with the Blessed Sacrament in honor of the Feast of the Most Holy Body and Blood of Christ (also called Corpus Christi). 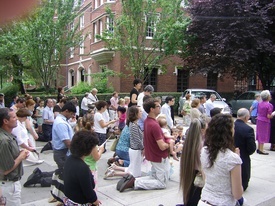 New Haven, Connecticut is no different: Saint Mary’s Church served by the Dominican Friars celebrated the Mass and formed a procession around the block though a small portion of the Yale University neighborhood. The Very Reverend Father Joseph Allen, OP, prior and pastor of Saint Mary’s presided at Mass and led the procession. Allen reminded us of Christ’s gift of Presence to the Church and it is an extension of Christ’s sacred humanity and divinity now, and the fruit of that presence is unity of faith and service to neighbor. 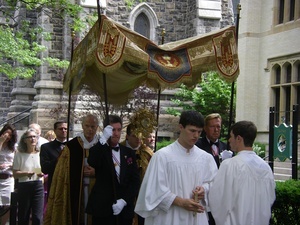 Also assisting Father Allen in carrying the Blessed Sacrament is the recently ordained Dominican student brother, Brother Austin, assigned for the summer to Saint Mary’s Priory and Church. 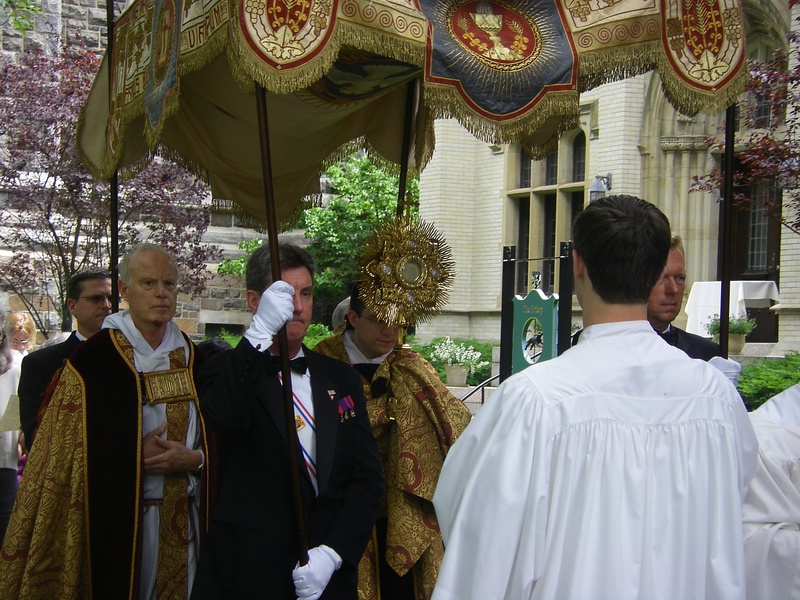 You may recall that since the 14th century a custom formed in carrying the Blessed Sacrament around town following Mass. Popes encouraged this devotional practice –even giving indulgences to those who walked with the Blessed Sacrament– and by the 16th century, the Council of Trent approved a public demonstration of the faith in the Eucharistic Presence. Through the various periods of Church history extraordinary events and processions developed with every segment of civil society taking part. In some countries the faithful wrote “Plays of the Sacrament” or performed “Eucharistic dances” as they did in Seville (not the type done by Sister Mary Leotard) to express their faith in the enduring Presence of the Lord. 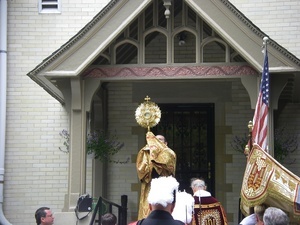 Today’s Eucharistic procession stopped at stations, a typical Roman liturgical custom, for a moment of prayer with the Blessed Sacrament which included singing “Tantum ergo,” the a prayer, benediction and the recitation of the Divine Praises. For us two points were selected outside the church and one at the main altar calling to mind the practice of Pope Martin V.
Holy Mother Church teaches us that her observance of Corpus Christi is a response that’s both doctrinal and pertaining to Divine Worship in the face of wrong teaching on the place of the Eucharist in ecclesial life. In many places, either in CCD, preaching at Mass or in conversation among friends, the mystery of the real presence of Christ in the Eucharist is misrepresented or ignored. Looking at many examples of contemporary church architecture I’ve noticed the displacement of the Eucharist from being central to the margins of the Church (cathedrals and monastic churches excepted). This is especially crazy when pastors renovate their traditional churches and move the tabernacle to a side chapel based on a mis-reading of the church documents and a faulty eucharistic theology. If you are in the NYC area stop by at the Jesuit Church of St Francis Xavier on West 16th Street and you’ll see what I mean. There the Jesuits moved the tabernacle to a side altar and replaced the traditional place for the tabernacle with components of a baptistry (a review of the recent renovation later). The concern for the Eucharist as central to one’s life is obviously nothing new to us today –or in the 2000 year history of the Church– as it was a concern of Pope Urban in 1264 when he gave the Roman Church this feast. 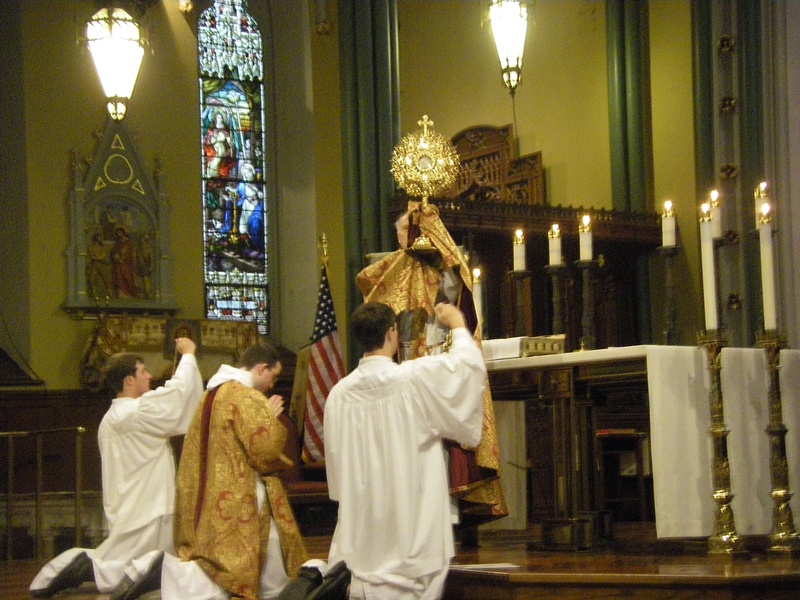 2. all forms of Eucharistic devotion must have an intrinsic reference to the Eucharistic Sacrifice, or dispose the faithful for its celebration, or prolong the worship which is essential to that Sacrifice (Directory of Popular Piety). 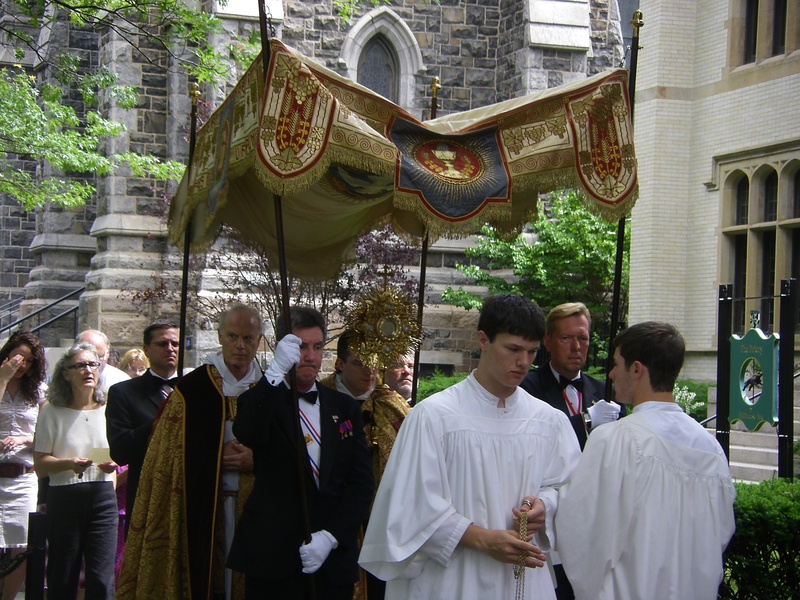 What we did today and what others around the world did, is to make a public profession of faith in the promise of Christ to be with us till the end of time in the enduring Presence of Christ in the Eucharist. Last week there was an extraordinary Mass of Saint Gianna and a talk by the saint’s son at the Church and Priory of Saint Catherine of Siena (E. 68th St, NYC). I still find it amazing to say that a saint’s son is talking about his mother, a saint of the Church. Dominican Brother Ignatius Perkins wrote a reflection on what he experienced and gave some helpful links to a story in the Catholic New York and the video on Currents TV. Having been there myself –though serving the Mass– I am still in awe of the event because I think it truly was an encounter with Christ. Some many people came to meet Christ through the witness of Saint Gianna, the Mass and others. I wouldn’t be surprised if several miracles result from this event. The Church of Saint Catherine of Siena was packed with people (SRO) with stunning music and fine preaching. The presence of the staff of the Dominican Friars Healthcare Ministries and the Gianna Center was aslo a beautiful thing. The faithful, indeed, wrote their intentions for Saint Gianna’s intercession and venerated relics of the saint. Admittedly, I am not terribly enthralled with Palmo’s perspective church-matters, nor his speculation on some things, nor his disrespect for the Holy Father, hence I wonder by what criteria did Aquinas Institute use to decide on giving Rocco Plamo these honors. But may these are the criteria by which the Dominicans of the Central Province judge excellence, getting in touch with those on the margins and theological thinking. Rocco is hardly a journalist, at least not by industry standards in the way John Allen or or Cindy Wooden or John Thavis are journalists; but he can be informative humorous but much too gossipy (the later not being a Catholic virtue and certainly unbecoming of the new evangelization). What was Aquinas Institute President Father Richard Peddicord thinking? Could Rocco Palmo be now the new type of preaching we can expect from the Order of Preachers? Even the St Louis Post Dispatch’s article is trite. It is a free world, after all, but give me a break. So much living the Dominican motto: to praise, to bless, to preach.